Some days, you just feel like wearing a muummuu, right? Or is this just me? Even if I stand alone on this one, I love a good vintage muummuu. In the below photos, you can see how giant this dress is and then how different it looks once it’s belted. 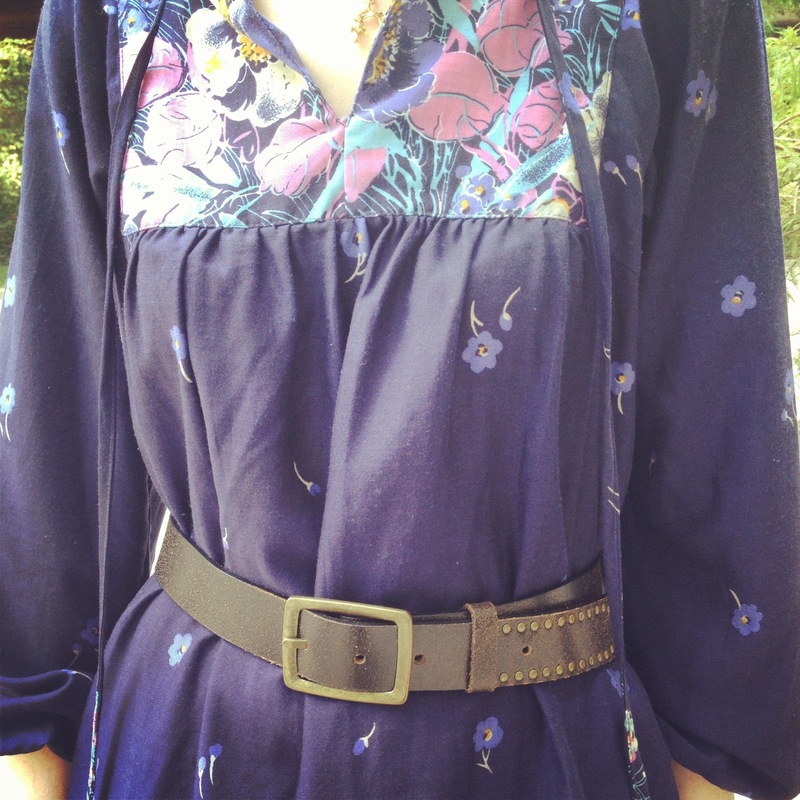 And seriously, the unbelted photo really doesn’t convey how truly muumuu this dress is. 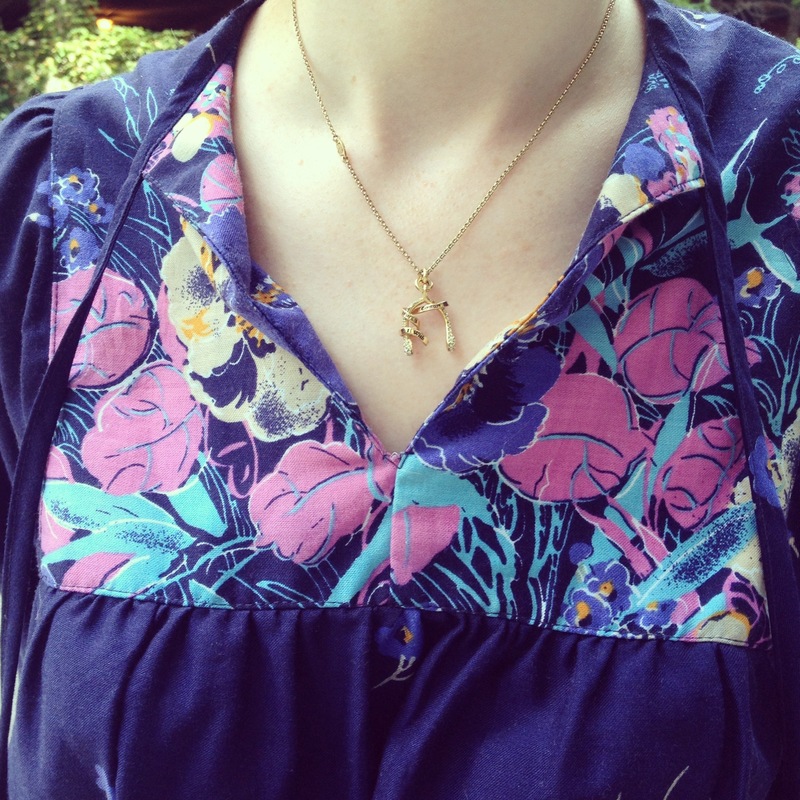 Here’s how I accessorized my 1960s house dress. 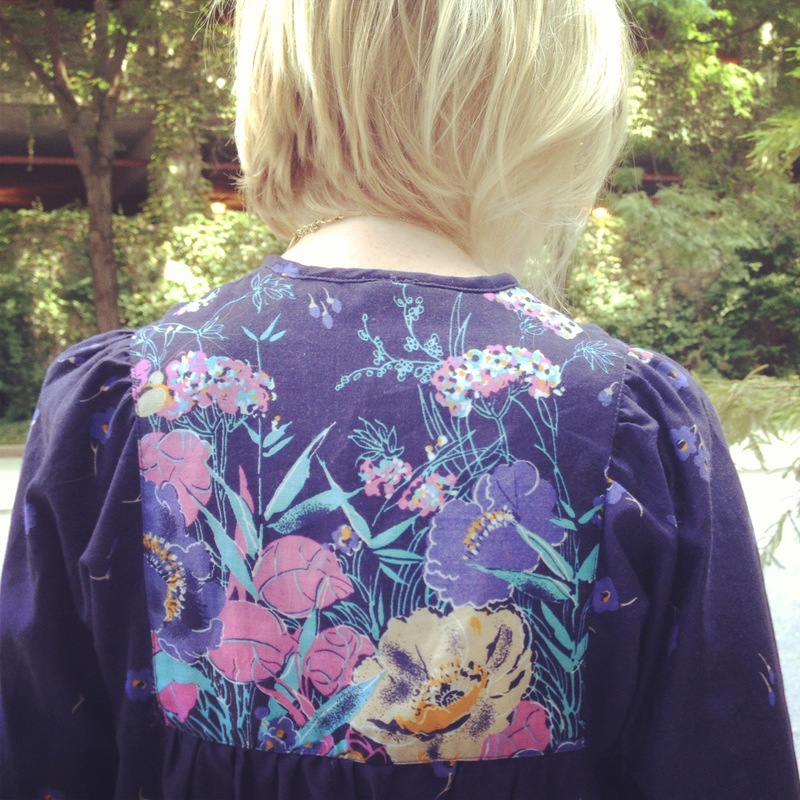 I love the front and back panel of the coordinating fabric. 1) I’m by no means a vintage expert, but I am buying more vintage pieces lately and really enjoying it. One thing I have noticed is I’ve gone into a few vintage shops and found dresses with no tags, no markers of dates, and a staff’s inability to explain how the dress was acquired. Maybe it’s just me, but I was a bit cynical in those shops. It seems a bit odd to charge $100+ for a dress that may or may not even be vintage in the first place! As a result of this, I’ve tried to stick with shops that can approximate the date on the dress(ex: 1960/70s house coat) and/or how it was acquired (ex: estate sale). However, because I’m not an expert in this (yet! ), I say go with whatever makes you feel most comfortable when shopping vintage and look for reputable shops. Here is an InStyle article that reviews more vintage shopping tips. 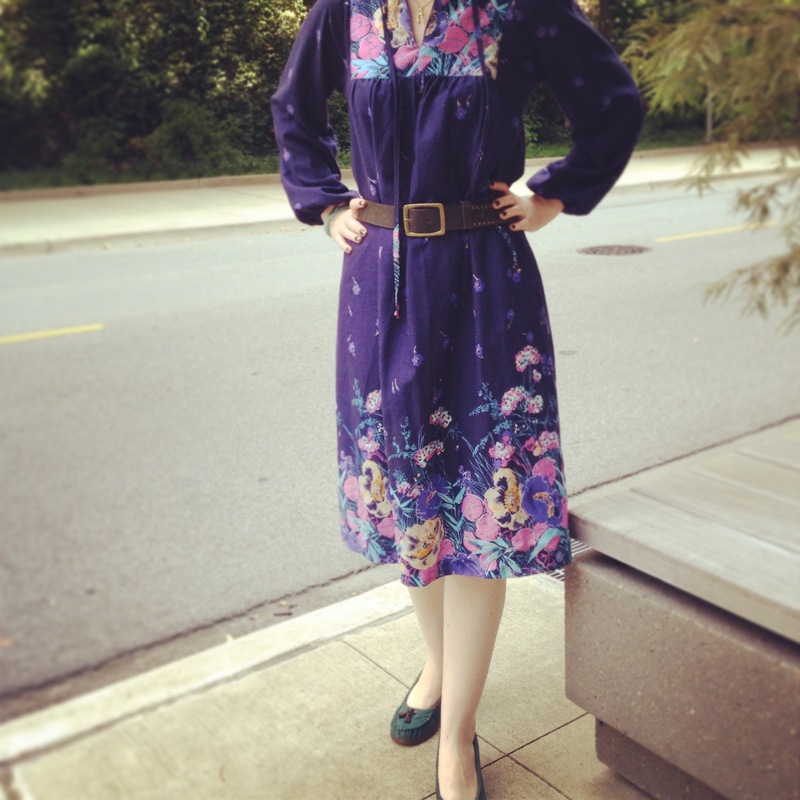 2) Vintage, and dress shopping in generally, can mean somewhat varied fits in dresses. This dress looks really different belted than it does without a belt. When I shop consignment and vintage, I generally wear a tank top, and carry a belt in my bag in case there isn’t one in the store. If you think carrying a belt is too bulky for your purse ( my purse has been called a mini suitcase), then consider carrying a ribbon with you to serve as a makeshift belt. I’d love for readers to chime in with their vintage shopping tips! Anyone have any great tips? I never have this kind of luck vintage shopping! I need to kidnap you and take you along next time, this piece is beyond gorgeous! Really pretty vintage dress. I love the darker floral print especially for the Fall. very cute and looks comfy! I love this outfit! The colors are beautiful and the necklace is so dainty! I am so in love with your vintage dress! I love vintage! The belt really does make all the difference! Great find! This is what you call “comfort chic,” I’m a fan. 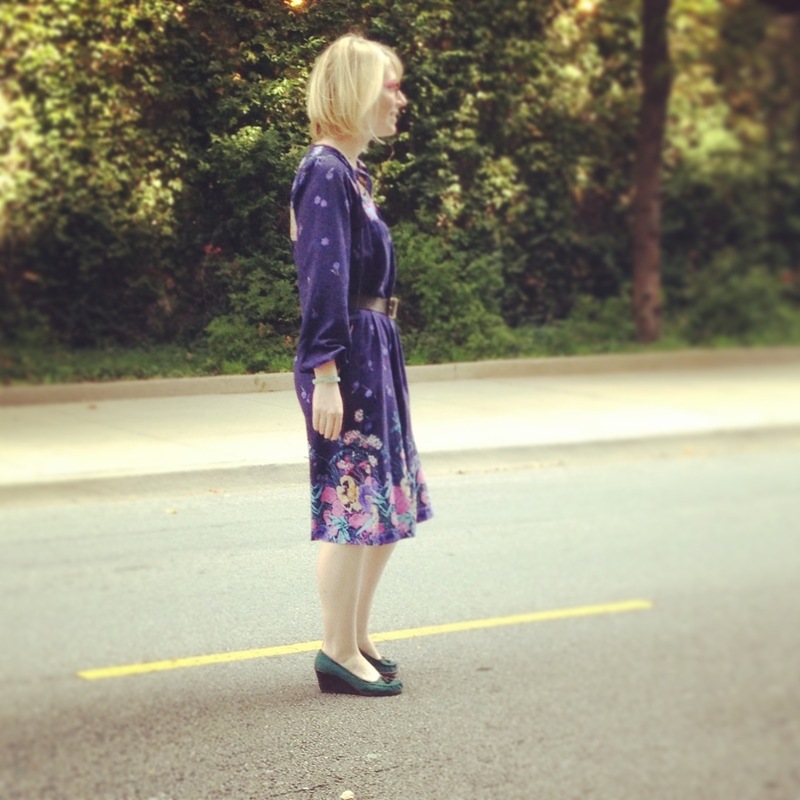 I love how you restyled this super cute vintage dress. The belt adds a different dimension to it completely! I’m with you on the muumuu love 🙂 Love that you belted it plus the color is wonderful. Like you, I’ve recently been exploring in the vintage arena and I love it! !